Whether youre traveling for work, or taking a vacation from it, let Courtyard Detroit Downtown meet all your travel needs. Located in the heart of downtown, we are surrounded by the citys hottest attractions, including Little Caesars Arena, Comerica Park, Fox Theatre and Greektown. 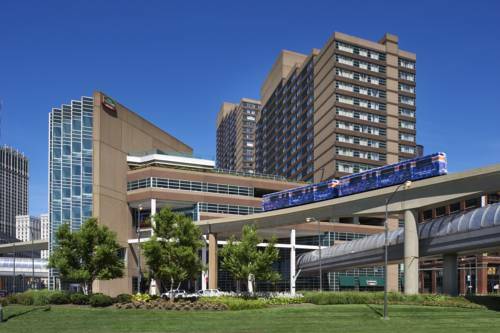 Detroits public transportation system, the People Mover, has a stop right inside our building and we are just a short walk from Detroits street car transit, the QLine, which helps make getting around town easy during your stay. After a fun-filled day of adventure, retreat to one of our comfortable rooms or suites with thoughtful amenities, including free Wi-Fi. Relax with a bite to eat at our brand-new combination IHOP/Applebees or get going with a workout in our fitness center or refreshing indoor pool. Plan an upcoming meeting or social gathering in one of our seven flexible event rooms with custom seating plans, catering options and AV equipment. Make your visit to the Motor City memorable when you stay at Courtyard. IHOP: Now open everyday from 6am-11am for breakfast. Applebee's: Now open daily from 11am-12am.